Purpose: Justarrive was a fast growing company that needed to revamp its web site to reflect the current state and vision of the company for the upcoming press launch. Description: The site was developed and launched in approximately 4 days time, incorporating the Justarrive brand. The navigation and layout are designed to be professional and clean -- a necessary criteria in order for a new company to gain credibility in a traditional market place. 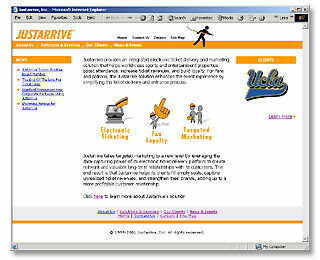 Furthermore, the index page incorporated all major information in a graphical way as well which included, a animated gif of current clients, solutions and services, and the latest industry news on Justarrive. Since this the site has gone through one more minor revamp. "Take Me Out Without Tickets: Just Arrive to the Ballpark"